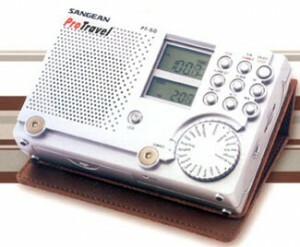 The Sangean PT-50 is a portable FM / AM / SW 1-7 analog shortwave receiver with world times. Rotary World Time Zone Dial. Alarm Function w / Humane Wake System (HWS). Dual Time (12 / 24 hr.). Please contact us if you have a review for this radio. This entry was posted in Analog, Portables, Sangean and tagged PT-50, Sangean, Sangean PT-50. Bookmark the permalink.